Enjoy an unforgettable Easter this year with your family and friends over an extravagant Brunch feast at Choices Restaurant and Terrace. The brunch, priced at BD25/36 net, is filled with succulent dishes, sumptuous live cooking stations and an extensive dessert section all while enjoying a live performance from their in-house band on 21st April from 12:30pm to 5pm. This year, pamper yourself and your beloved ones with a sumptuous Easter brunch at Flavours on 2 on 19th April for BD 22 NET including soft drinks and juices or BD 33 NET including selected beverages. Get entertained with our mesmerising saxophonist playing live with your favorite tunes. Indulge in a stylish setting with special crafted mocktails and cocktails section and live cooking stations. Enjoy the Friday Family Brunch at Al Naseem & La Brasserie from 12:30pm to 3:30pm for BD10++. A live grills buffet dinner is also available from 7pm to 11pm for BD10++. Every Saturday, indulge in ‘Sizzling Sensation’ with a special sizzler menu from 7pm to 11pm. Celebrate the timeless tradition of Easter with friends and family at Bahrain Bay Kitchen on 129th and 21st April from 1pm to 4pm. Savor an exquisitely paired menu of mouthwatering Easter favorites and chocolate treats. The little ones have something to cheer about too with a fun egg hunt and other engaging escapades. The Easter promotion is priced at BD35/45.5 net. Celebrate Easter this year with a traditional Easter dishes together with wide range of Easter cakes and sweets on 19th of April, 2019 from 12:30pm to 4pm at BD 28 net including soft drinks and water or BD 40 net including selected free flow beverages. Be entertained by the live music from the Twin Band. Enjoy dishes ranging from hot and cold appetizers and salads to delicious intercontinental dishes and delectable dessert to treat your taste buds. Kids below the age of 6 years enjoy the buffet for free while it’s half price for kids between the age of 6 to 12 years of age. Get the complete urban brunch experience with the family from 12:30pm to 4:00pm. Enjoy a lavish Friday Brunch at Ya Hala that will guarantee you a laid back weekend. Take advantage of the best value brunch with live cooking stations, amazing view of Amwaj Marina and kids entertainment just perfect for your weekend. The brunch is priced at BD 8++, BD 10 ++ with soft drinks and BD 18++ with select. Enjoy delicious Spanish cuisine delivered to your table accompanied with unlimited beverages. Diners can enjoy a fabulous array of tasty dishes delivered freshly cooked to their table while enjoying spectacular golf course views while enjoying the Live Latin American Band. Thursday Night brunch is available at Links restaurant every Thursday from 7pm to 11pm and costs just BD 26 NET per person inclusive of unlimited selected beverages. And BD18 Net without alcohol. 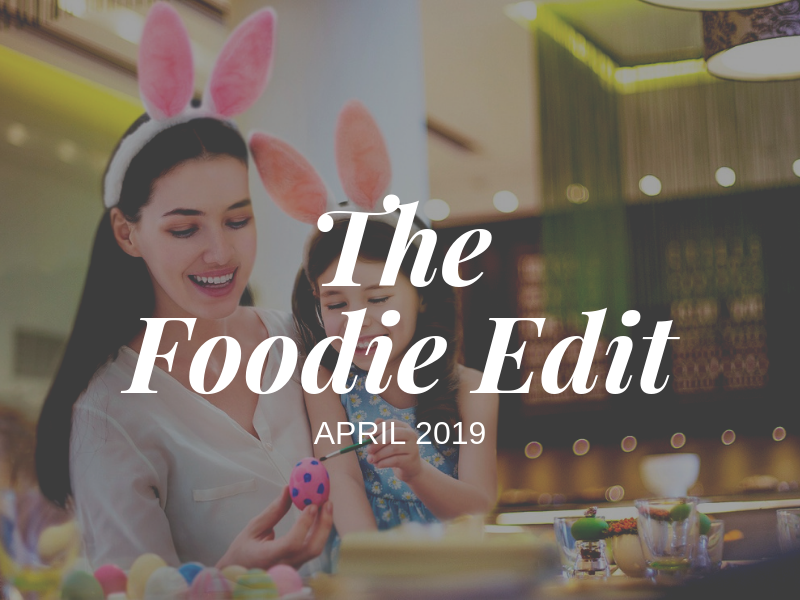 Foodies can indulge in a Seafood Promotion at Golestan, a Mexican Snack Promotion at An Nada Lounge or a Poke Bowl Promotion at Soie all throughout April! On Easter Sunday (20th April), a special breakfast buffet that includes some special Easter activities for kids will be served at Al Iwan. Enjoy a sumptuous buffet spread for breakfast, lunch and dinner along with an option of a lavish a la carte menu at Al Safir Restaurant for only BD10++. Ladies, enjoy the Kingdom’s favourite Grand Friday Brunch with a fabulous 50% OFF on the 12th of April! Come down with your girlfriends to Sofitel Bahrain and enjoy a spectacular brunch affair featuring a mouth-watering selection dishes and drinks with the greatest hits performed live by the Cuban band, Latin Soul. For info and reservations, call +973 1763 6363. Come and grab mouth-watering and unique range of Easter themed cakes from 1st April to 30th April at Furn Bakery. Enjoy a la carte BBQ at Nasmat Pool Bar (located at the 3rd floor of The Westin) every Thursday & Friday from 5pm to 10pm. Those who are working in the hospitality industry can enjoy 50% discount on their total bill. Daily from 6pm ‘til closing. Enjoy an unlimited lavish buffet at Café Mosaic’s Friday Brunch complemented by live cooking stations, seafood grills, a sumptuous choice of desserts and soothing live music from 12:30pm to 4pm. The friendly staff is on hand to create a memorable experience, while children can have fun with special entertainment. Priced at BD 12++ with soft drinks and BD 22++ with select beverages.